We know what it's like to lose a loved one and we're not afraid to talk about it. We know what it’s like to lose someone and we aren’t afraid to talk about it. The Dinner Party is building a worldwide community of 20- and 30-somethings who have each experienced the loss of a parent, partner, child, sibling, other close family member, or close friend. There are between 1 and 50 tables in each of these cities. Want to join an existing table? Apply and join the waitlist here. Curious how this thing works? Check out our illustrated guide below, or read through our FAQ’s. You lose someone significant in your life: a parent, sibling, partner, child, or close friend, whether 3 months ago, 3 years ago, or 3 decades ago. It’s harder to connect with family or friends. You feel isolated, alone, unsure of how to move forward with your life. You think “What! This exists? !” and fill out submission form to “Join a Table”. It’s a little long, by design. We want to give you a chance to tell your story, to write the name(s) of those you’ve lost. A member of our staff reviews every single application we receive. 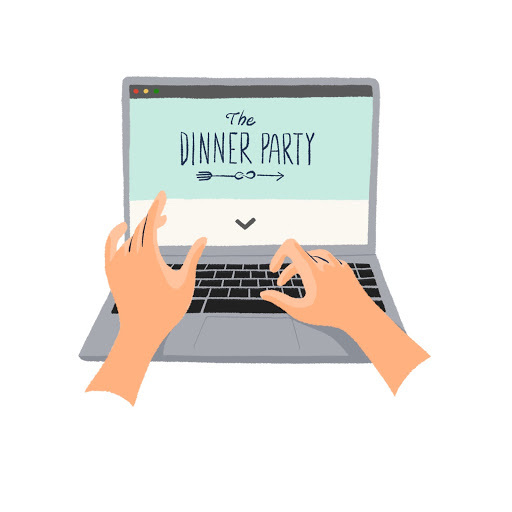 Once there’s a table that’s a good fit for you, you receive an introduction email from our staff, connecting you to your trained volunteer Dinner Party Host. Don’t worry — they’ve experienced loss too. We consider what life phase you’re in, the type of loss you’ve experienced, and, if possible, what table would be convenient given where you live. You submit a $35 membership fee to officially join. Your host emails you within a few weeks with information about the next dinner. Depending on the group, this might be the first dinner for everyone or we might match you to a group that’s already up and running. You attend your first dinner, likely at your host’s home. You probably experience first-dinner nerves, but you bring what you can — a bottle of wine or a loaf of bread — anyway. You ring the doorbell or text your host and find yourself in a room with other people around your age who have also experienced significant loss. Once everyone grabs something to eat, your host will start the conversation and you’ll introduce yourself and share what brings you to the table and where you’re at with your loss right now. The conversation will flow and you’ll listen while others do the same. You keep coming back, and realize your heartache can also help create amazing friendships and forward motion in your life. The Dinner Party is not about one-off dinners. It’s about building community and connection over time. Your table will meet every couple months or so and you’ll start getting to know more about your fellow Dinner Partiers beyond just their story of loss. You feel less alone and have new friends who you can share all parts of your story with — even the parts that rarely see the light of day. Sound like The Dinner Party might be right for you? Introducing The Dinner Party Manifesto. Read, Share, and Pull Up a Chair. Believe in thriving, not just surviving in #lifeafterloss? Sign up for our newsletter to stay in the loop. The Dinner Party is a project of Community Partners.